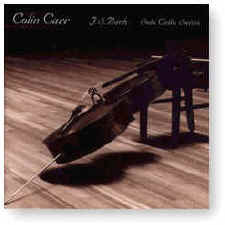 The complete Solo Cello Suites of Bach recorded by one of the most extraordinary cellists of his generation, Colin Carr, winner of the Rostropovich International Cello Competition Grand Prize and the Piatigorsky Memorial Award. Captured in minimally edited, electrically charged performances in the sparkling acoustics of Jordan Hall at the New England Conservatory of Music, Carr achieves that rare balance between personal “interpretation” and scrupulous consideration of the score that epitomizes musical performance at its loftiest. Whether it is in the driving — at times cutting — hell-bent energy of these interpretations, profoundly moving and gentle effusions or in Colin’s exquisite taste and musical intelligence, these performances capture a truly extraordinary event. ONLY A FEW COPIES LEFT! Now available for downloads on iTunes as well as Amazon, Rhapsody, eMusic and other digital sites. Recorded on 19 September 1994 (Suite 1, 3 & 5) and 23 September 1994 (Suite 2, 4 & 6) and 25 September 1994 in Jordan Hall at the New England Conservatory of Music in Boston, Massachusetts.